I’m surprised that I’m able to coherently write this tonight, but after receiving quite the cocktail of anesthesia and various narcotics, I’m jittery and wide awake. I’d much rather be sleeping, but since I’m not, I’ll take advantage of this opportunity to share my eventful day with the world. My pre-registration appointment for the D&C was on Friday and I was fortunate enough to take care of the admitting paperwork (re: the bill) prior to the surgery. I’m not sure who this is fortunate for, but I’m leaning towards it being the hospital. Several hours after the appointment, my throat started hurting and the body aches spread over me. My immune system does not play nicely when it comes to stressful times. Instead of putting up a fight and helping a girl out, it goes on vacation and leaves me wide open for sickness to come in. I really didn’t want to get sick before my surgery, so I tried as best I could to battle the symptoms (within the medication restrictions, basically that left me with Tylenol), but ended up having to call and inform my doctor of the sudden emergence of symptoms. Luckily, the surgery was not cancelled and I was prescribed a Z-Pack, and I didn’t seem to get any worse. Thank God. The surgery was scheduled for 7:30am, we arrived at 5:50am, I checked in and changed into what the receptionist affectionately called my party gown, party hat, and party socks. I think she thought I was a lot younger than I am. Even though I brought my husband. Anyways. I put on the required attire and the poking and prodding began. Some vitals, a urine sample, and a few torture devices (AKA anti-embolism stockings that encourage blood flow throughout the legs and feet, see photo here) later, I finally met with the anesthesiologist and my doctor. Questions were answered, my first of 3 IVs was started, and round 1 of cocktails was injected. They wheeled me down the hall to the (freezing) OR and transported me onto the operating table. The Versed (relieves anxiety) hadn’t taken affect yet so I was incredibly lucid, which I hate. They realized why it wasn’t working yet, there was a problem with the first IV (vein collapsed), so they put in the second IV. 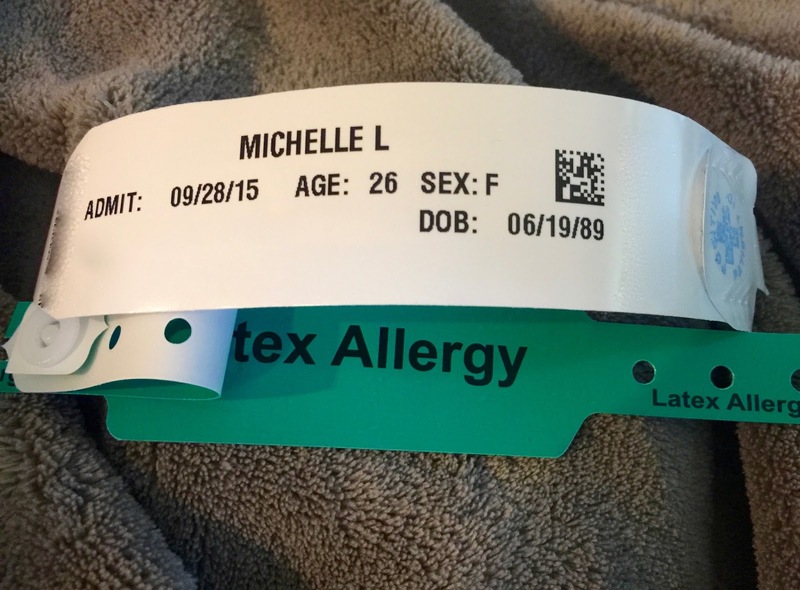 I was given another dose of Versed, anti-nausea, and loopy medication (her words, not mine), and about 60 seconds later I was waking up angry and distraught. Since I had a sore throat and some congestion, I had to be intubated this time. Being intubated causes sore throats. So, I woke up with a sore esophagus/throat on top of a sore throat. And another collapsed vein/new IV. I was also hyperventilating, semi-crying, and asking about 1,000 questions. Where’s my mom? Can I have something to drink? I feel sad. Is it okay if I cry – is that normal? I feel really sad. I hurt a lot. Can I have ice? When will my family get here? Are they coming yet? Can I have cake? I will say that the nurse I had in recovery was so sweet. She answered every question, soothed me, and even talked to me about my favorite cake. Since I was having a hard time taking deep, consistent breaths, she put me on oxygen for a bit. I was in a very dazed state when my mom and Kevin showed up. They kept asking me questions, I thought I answered them, but apparently that was just in my head. The nurse also gave me ice and then I was sent over to a room to finish waking up and discharge. The three requirements to leave are eat, drink and pee. The new nurse gave me the worst graham crackers I’ve ever had. They were not Honey Maid and they made my mouth feel like the Sahara desert. But I ate them, drank some Shasta Cola, and went to the bathroom. Three for three, mission accomplished. Other highlights of my day included: Cracker Barrel To-Go for lunch, a 25 minute nap, my mom making me cupcakes, and a lot of doggy snuggles. It has been a pretty rough day, the three IVs did some damage to my arms (lots of bruises, track lines, irritation, etc), my throat feels like a tube was shoved down it (oh, wait…), and other unmentionable parts of my body have their own problems going on (we won’t get into that). But, I am thankful. I’m alive, I didn’t lose excess blood (which can be an issue when suctioning a molar pregnancy), I have an amazing husband who goes above and beyond for me, and parents that do anything and everything they can for me. I have so many things to be thankful for, so instead of focusing on this temporary pain and discomfort, I am choosing joy. I haven’t even begun to deal with the emotional side of this surgery yet, and I know that’s coming, but I can still choose joy even through the grief. I’ll falter, take steps backward, and fail along the way, but I know I won’t be alone. Hopefully after getting that off your chest, you can get some sleep tonight! I love you!